Jimmy Garoppolo Autographed Helmet - 49ers Deluxe Replica | Sports Memorabilia! This is the full size 49er Deluxe Replica Riddell Jimmy Garoppolo Autographed Helmet! These Deluxe Replica Helmets do not have the holes in the top of the helmet like the Speed version. Therefore many people prefer this style of helmet over the Speed version as the holes will not interfer with the location of the autograph. 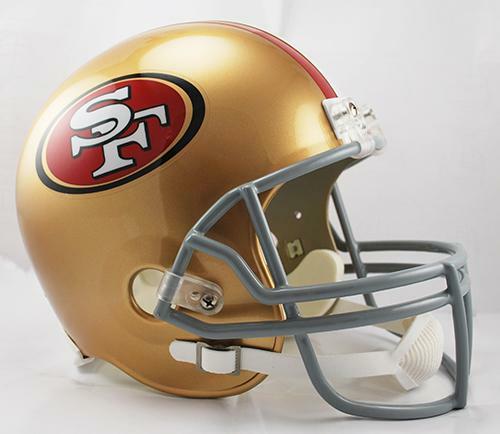 The 49er Speed Replica Full Size helmet is also available for $10 more. Please visit this link "Garoppolo Speed Replica Helmet". To see all the Jimmy Garoppolo items available or to send in your own items to be autographed by Jimmy G visit this link "Jimmy Garoppolo Signing".